If you followed way back in the day...like 2008-2009 back in the day...you might vaguely remember that I use to do something called What's to Eat Wednesday. (Notice I'm not linking here...I'm still no food photographer, but my picture quality was laughable back then. It probably still is, but I just don't know it yet...funny how that works right?) I love to cook when I have the time and I hate doing the same thing over and over again so I thought I might as well share some of the keepers. I'm not committing to every week post, but I might be bringing back What's to Eat Wednesday from time to time. I found this recipe in my September Southern Living magazine and just knew it would be a winner. I'd love to say I'm all experimental and really shook this recipe up to call it my own, but I'm a follow the rules kind of cook and only changed a couple of things. 1. Preheat oven to 400°. Sprinkle pork with salt and pepper. Cook in hot oil in a large ovenproof skillet over high heat 3 to 4 minutes on each side or until browned. Add onion and plums. The original recipe said to bake for 15 minutes, but I always find it takes quite a bit longer to get done. I ended up baking for 30 minutes and it was anything but dry. I always do a little slice test if I can't find a meat thermometer. 2. 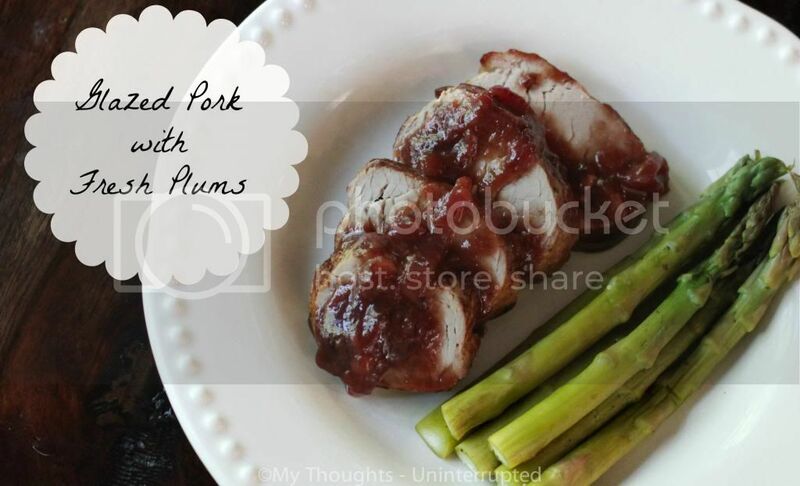 Transfer pork to a serving platter, reserving drippings plums and onions in skillet. Cover pork loosely with aluminum foil, and let stand 10 minutes. 3. Meanwhile, stir vinegar and preserves into drippings, plums and onions; cook over medium-high heat, stirring constantly, 3 to 5 minutes or until slightly thickened. Remove from heat; stir in thyme. Pour over pork and plum mixture. I ended up cooking the plums and onions longer than suggested as well and I thought it worked brilliantly If you are one of those weirdos that dislikes hot fruit (seriously, you are missing out! )...I'd suggest cooking longer as I did because really the plums just melt into the sauce. Delicious! So there you go, a quick easy and somewhat impressive looking weeknight meal. Are you following? Click the "Like" button.